This inflatable obstacle course is the one to show your metal on. Race a friend or someone from the office. A fun and interactive challenge on this 110' Monster Obstacle Course you won't soon forget! This inflatable obstacle course is made of up three unique pieces: 45' inflatable obstacle course with slides, pop ups, and an inflatable wall to climb over; an dual lane gigantic inflatable slide; and lastly the awesome inflatable rock climbing wall with slides. Give Bouncin' Around a call and book today. 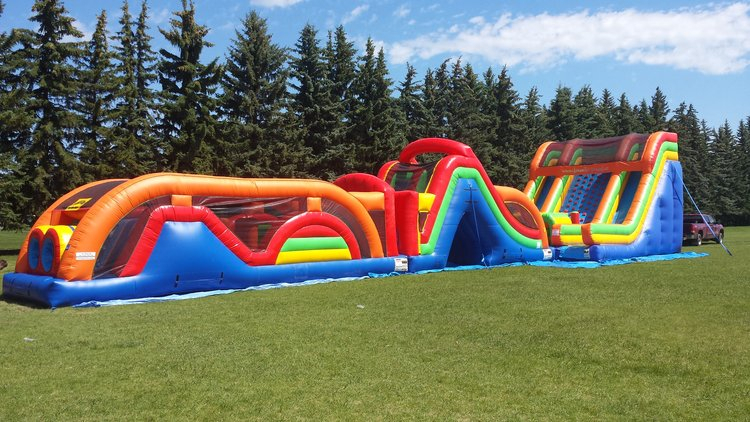 We offer a wide variety of inflatable bouncy castles / bounce houses/ slides, carnival games, concession equipment and party rentals that will make your event memorable.